Extend the reach of your power and aim for the top with GenPower Power Cords, exclusively available online on Edisons. A staple in any workshop and worksite, GenPower Power Extension Cords provide safe, secure and dependable power extension solution. Power where you need it, when you need it. 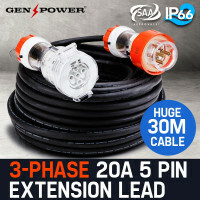 Available in lengths of 10M, 20M and 30M, GenPower 3-Phase 20A Power Cord Extension Lead features IP66 rated 5-pin fixtures connected to a rubber-protected cable, allowing you to work anywhere from a single power access. The plug and socket are modelled on Clipsal standards and engineered with industry leading components. 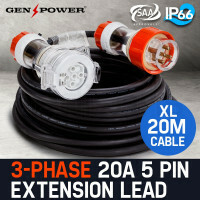 An oversized grip for easy connection, clean lines for minimal dirt build-up, a thread lock, and a spring-loaded protective cap round up the many features that make GenPower Power Cords one of the best out there. For all your power generation needs, Edisons also offers an extensive range of durable and affordable Generators, Transformers, Inverters and Stationary Engines. All GenPower Power Cords are backed by an extensive 12-month warranty for domestic use and standard 3-month warranty for commercial use. Edisons guarantees fast and easy delivery anywhere, whether you’re in Sydney or in the Outback. What are you waiting for? 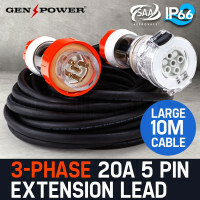 Buy a GenPower Power Cord today!